These Caramel Apple Breakfast Cupcakes are perfect for a weekend family brunch. 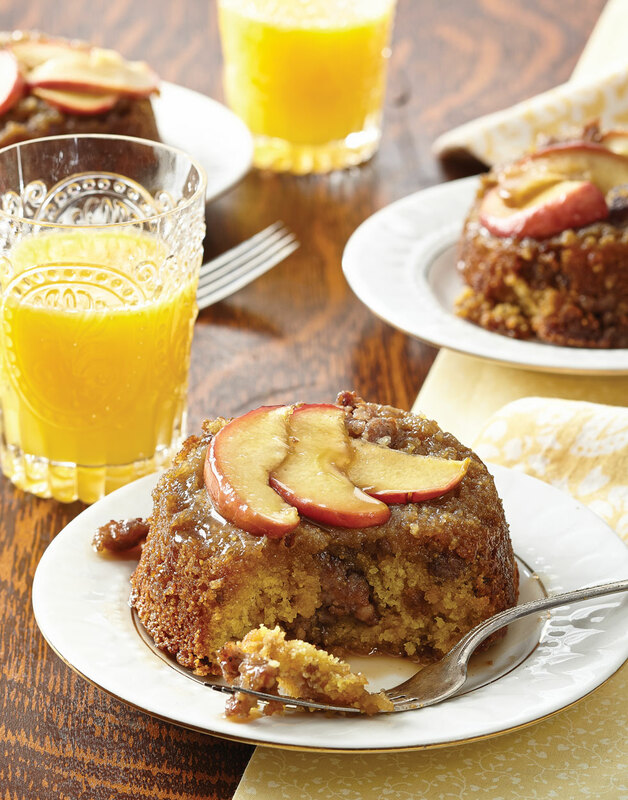 The sausage-filled corn cupcakes are baked in caramel and topped with apple slices. These cupcakes are an excellent blend of sweet and salty breakfast fare, and will fill your kitchen with sweet aromas and eager, hungry family members. If you don’t have a jumbo muffin tin, or if you want to serve these cupcakes for a buffet, the batter can be baked in a greased 9-inch cast-iron skillet for 30 minutes. Preheat oven to 350°. Coat six jumbo muffin cups with nonstick spray. For the cake, combine flour, cornmeal, brown sugar, baking powder, baking soda, and salt. Combine yogurt, milk, oil, eggs, and egg white in another bowl. Brown sausage in a skillet, about 5 minutes; drain on paper towels. For the caramel, whisk together brown sugar, cream, maple syrup, bourbon, and salt in a skillet over medium-high heat, stirring often. Bring caramel to a boil, reduce heat to medium-low, and simmer 10 minutes. Stir sausage into flour mixture and add yogurt mixture; stir just until combined. (Mixture will be slightly lumpy.) Arrange apple slices in muffin cups. Divide caramel evenly among cups; top with a generous ½ cup of batter. Bake cupcakes until a toothpick inserted in the centers comes out clean, about 30 minutes. Let cupcakes cool briefly before turning out of muffin tin. Fan the apple slices in the bottom of each cup. Make sure each slice makes some contact with the cup. Run a paring knife around the edge of each cupcake to ensure they drop out when the pan is inverted.